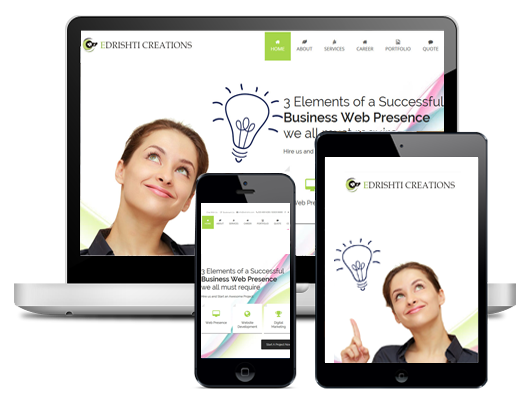 eDrishti Creations is a leading web development company provides one-size-fits-all creative services from Branding to Web Design to Social Media Marketing. Hire us and Start an Awesome Project. Give your Brand a New Dimension! 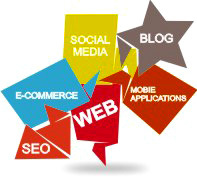 eDrishti Creations provides one-size-fits-all creative services from Branding to Web Design to Social Media Marketing. Brand as a "name, term, sign, symbol or design, or a combination of them intended to identify your presence in whole world and differentiate them from others. Making your business stand out takes a more advanced strategy. This means building a site where we have updates about your services or products and gives consumers a way to contact you. Marketing gives you the opportunity to promote your products and services directly to the customers who most need them which you could possibly do via any medium. Get your Website New Look & Customize your design for any device. Small + Medium + Large ! One site for every screen with Responsive Design! Responsive designing is an entirely different designing than traditional web designing, Screen sizes will always be changing, so it�s important that your site can adapt to any screen size, today or in the future. eDrishti Creations makes it painless to customize your design for any resolution. Just switch your canvas to a different device, and optimize your design for that resolution. Get A Design Quote Now!. Succesful design is very much necessary to enhance you presence in business and marketing. A Logo or stationary design is very much necessary for your unique identity and brand image, it joins you with your customers and world. Big Commerce/Interspire provides a complete ecommerce solution and rated #1 e-commerce platform according to Top10 Reviews. Open source�applications are a better way to implement solutions within short span of time and you can manage your content easily. Print design leaves you with a physical thing, something you can touch and explore.It also remind the customer of your existence, which in-turn, encourages them back to your business. I had very limited knowledge about developing a web site and they have guided me through and they did a great job. They gave me the right programming solution and even the deigns of eDrishti was great. Always gave me the right solution and suggestion and I m more than happy with their effort and dedication. I will certainly always come back to them for any requirement. We sincerly belive in quote "Client is King" and so thus client satisfaction that is why we go a way beyond to satisfy their needs and requirment. .
eDrishti Creation is a leading web development company provides one-size-fits-all creative services from Branding to Web Design to Social Media Marketing.